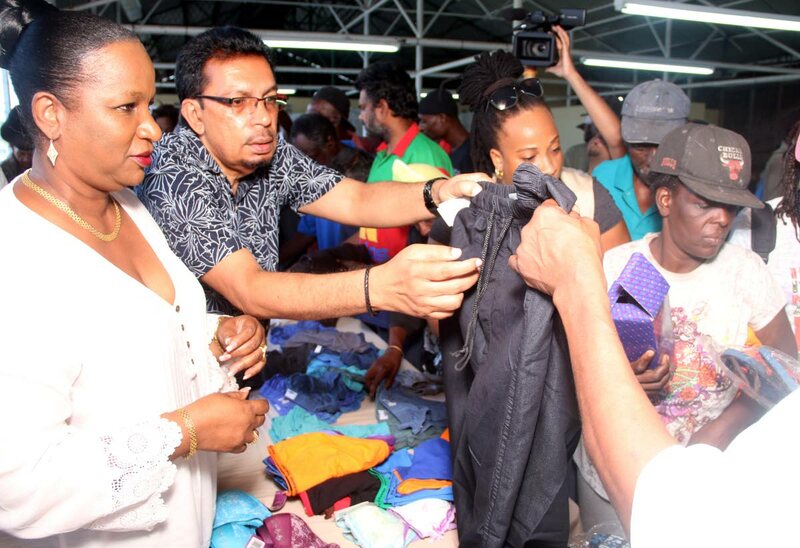 Minister of Social Development Cherrie-Ann Crichlow-Cockburn and Local Government Minister Kazim Hosein share items of clothing at the newly opened Centre for Displaced People in San Fernando yesterday. For the past five years, Frank Deonarine has lived on the streets of San Fernando, facing the elements and sleeping on hard concrete pavements. When Kazim Hosein was elected as the city’s mayor in 2013, he met Deonarine, who asked him for a pair of steel-toed boots. Hosein obliged as Deonarine told him he wanted to use to the boots for a job he was getting. Yesterday, Deonarine, who calls himself the president of the Homeless Association, sat at the head table as Hosein’s Ministry of Rural Development and Local Government, together with the Social Development Ministry and the San Fernando City Corporation held “Sharing a meal with the Homeless” at the San Fernando Centre for Displaced Persons. The centre was the brainchild of Hosein, who vowed to assist the homeless to get off the streets of San Fernando after assuming office as mayor in 2013. He continued to rally for the shelter to be opened even after he was appointed as a senator and minister in 2016. After speeches by Hosein and Social Development Minister Cherrie-Ann Crichlow Cockburn, Deonarine, 54, told Newsday he was very happy with the initiative. Over 80 homeless people attended the all-day event, where they were treated to manicures, pedicures, tested for high blood pressure and diabetes, given clothing and survival kits and meals. Members of the Revival of Ummah (ROU) volunteer group and the San Fernando Volunteer network provided staffing for the event. However, he would like to authorities to remove homeless people who are addicted to alcohol and drugs from the streets and give them proper care and treatment. Deonarine said he is a welder and fabricator and rents tools whenever he can get work. Reply to "Home for the homeless opens in San Fernando"